Combine the wheat flour, rye flour, and oat flour in a medium bowl. Add the cane sugar, baking powder and sea salt; give a quick stir to combine. In a separate bowl, whisk together the whole milk, eggs, and vanilla extract. Pour the milk mixture into the dry ingredients along with the melted butter. Stir until the batter is just combined but a few lumps remain. Preheat the oven to 200˚F and preheat the waffle iron. Make waffles according to the manufacturer’s directions. 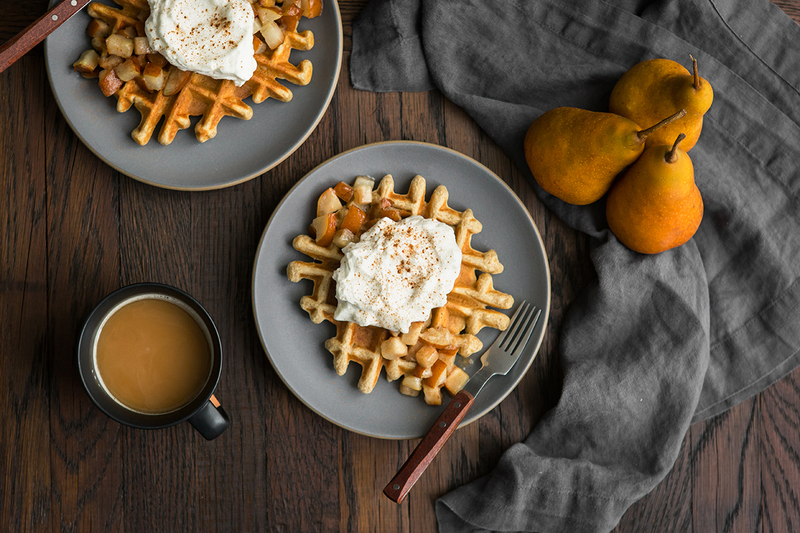 Transfer each waffle to a sheet tray in the oven, keeping the waffles warm and crisp until ready to eat. Heat a medium skillet over medium-low heat. Add the butter to the pan. Once the butter melts, add the pears to the skillet. Cook until the pears are almost tender, 4 to 6 minutes. Stir in the ground cardamom and cook for another minute or so. 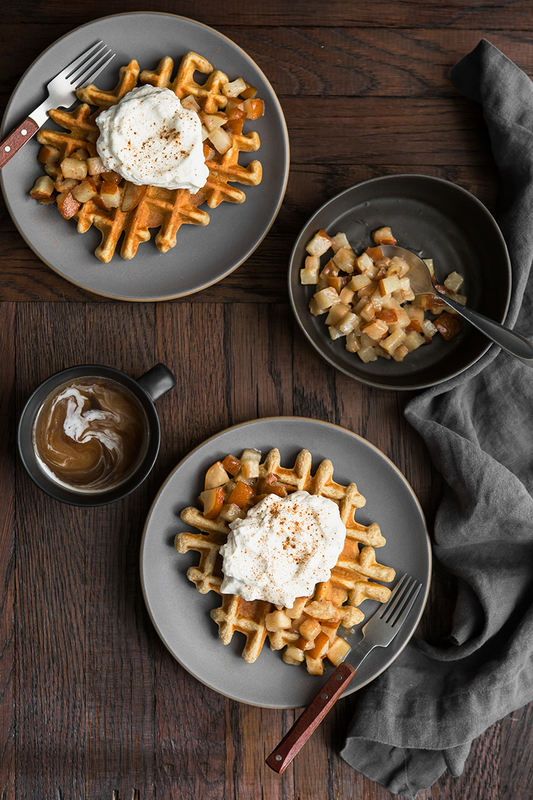 In a bowl, combine the whipped cream, maple syrup, and cinnamon. 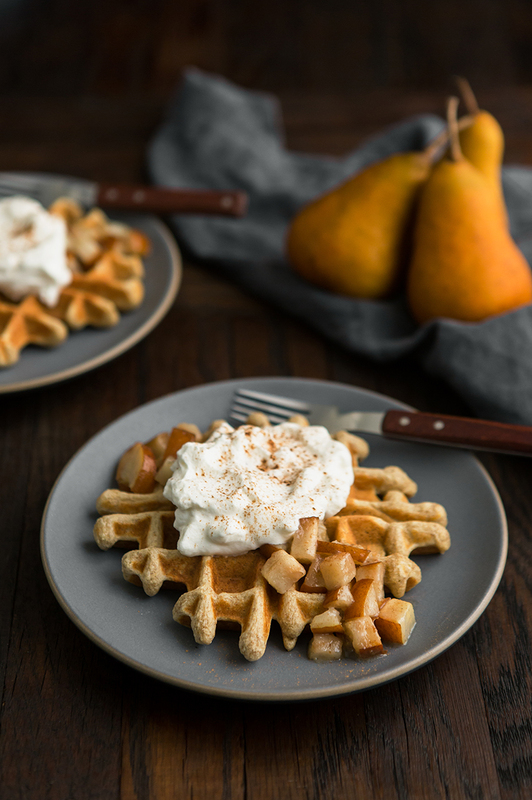 Serve waffles with extra butter, a few spoonfuls of pears, and a dollop of the maple whipped cream.